You are choosing a companion, and family member, to live in your home for the next 12 plus years. Be sure and spend time researching if this is the right breed for you, your lifestyle, and your entire family for many years to come. 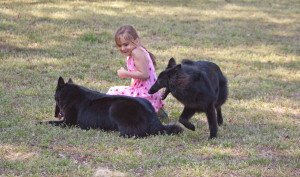 What kind of Temperament does a Belgian Sheepdog have? How are Belgians with children? 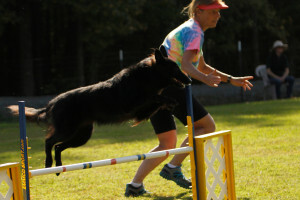 How much exercise does a Belgian Sheepdog need? How much grooming does a Belgian Sheepdog need? Do Belgians have health problems? While there is a range of temperaments and activity levels in the breed, in general they are willing to please and people oriented. They do tend to be sensitive and usually don’t take well to harsh training techniques. However some are strong willed and need firm consistent handling from puppy hood. 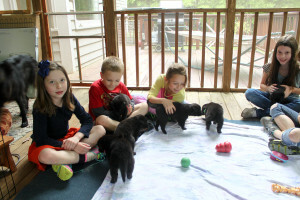 A responsible breeder will try and match the puppy’s temperament and energy level to its new home. Positive training does NOT mean permissive. All puppies need a leader and consistent rules to be a well mannered member of the family. Belgians, unlike the typical Golden or Lab, tend to be protective and territorial, they will protect their family and home, but this can be a negative in a busy household where there are frequent visitors and the family pet is expected to ‘know’ that one stranger coming into the home is ‘OK’ but another is not. That is asking for quite a bit of discrimination and a less naturally protective dog might work better. They can learn to discriminate, but building that ability takes time, training, and consistent socialization and exposure to a variety of situations and people over the first year to develop. I placed one puppy in a home where the Belgian soon bonded closely to their youngest son. Sometimes when his older brother and friends came over, and play became rough, and the youngest started crying, the adolescent Belgian would run in and nip at the kids hurting ‘his’ boy. Protecting their person is a good thing but these days it can mean a lawsuit. The mom took responsibility for training the puppy about proper behavior and spent several hours closely supervising the children whenever friends came to play and was able to teach the young dog that this was not acceptable. But it was a lot of work as it went against the natural instincts of the dog. If you are not able to closely monitor situations where your dog is interacting with young children it is best that you choose a different breed, or put dogs in a safe secure place when neighbors, especially children, visit. Belgians do not tend to handle rough handling and have a lower pain threshold than do Retrievers or some of the hound breeds and may nip when hair is yanked or tails pulled. My own dogs have shown great restraint in dealing with boys when they were young but it has taken training of both the dogs and the children to respect each other and behave properly. How much exercise does a Belgian need? 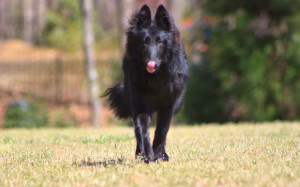 Belgian Sheepdogs are a working breed and should have a moderately high activity level and drive to work, this is what is needed for a good performance dog. Belgians have excelled in obedience, agility and tracking, they are highly intelligent, but unless they have a constructive outlet for their energy they can become bored and destructive. They need exercise and attention every day, because of this Belgians do not make good ‘backyard’ dogs. They like to be with ‘their’ person and will often follow them from room to room. They are excellent companions for joggers or hikers in dog friendly areas, with early training to ignore others on the trail. A good session of Frisbee or retrieving can provide an outlet as well when time is short. Often rescued or re-homed neutered dogs that are past the first two or three years of the highest activity can be ideal companions as they don’t have as high a need for physical and mental activity. 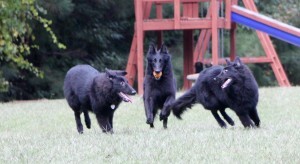 Belgians do have a strong prey drive and will chase deer or other wildlife if allowed to run loose. How much Grooming does a Belgian need? Coat care is not demanding on a regular basis. They do shed heavily two times a year, the soft dense undercoat comes out, especially in the summertime. At those times daily brushing is needed, at other times a good weekly brushing and nail trimming is adequate. Sometimes the soft coat in the breeches, around the ears, and on the tail will tangle and need extra attention. Show grooming is not complicated and most Belgians are shown and groomed by their owners. While they are a relatively healthy breed some do have hip and elbow dysplasia, some have eye problems and epilepsy. Be sure to ask for health clearances on the sire and dam of a litter. Breeders should have OFA (Orthopedic Foundation for Animals) numbers for hips and elbows as well as current CERF or OFA clearances for eye diseases. Unfortunately there is no test yet for epilepsy. Reputable breeders will research pedigrees and should be able to provide health information on most close relatives. I test for normal Thyroid levels as it can be a problem too but it is not done on a widespread basis yet by all breeders. I personally favor a Belgian that is social and enjoys interacting with people at shows and performance events but the Belgian Sheepdog is not a Golden or Lab, and shouldn’t be. They have been used for protecting home and farm as well as for police work and, if needed, have to be able to stand up to and back down unwilling livestock including intimidating cattle. This requires a dog with self confidence and the ability to react forcefully in the right situation. It is the owner’s responsibility to make sure their Belgian puppy is exposed to enough situations and given the feedback, both negative and positive, to ensure their Belgian matures with the ability to discriminate between appropriate shows of aggression, for example someone is breaking into the house late at night or trying to assault you while out for a jog, and inappropriate aggression when on a busy walking path or when friends come to visit. 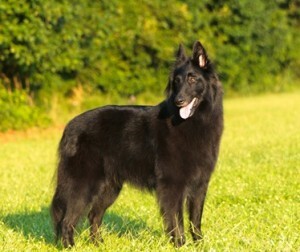 The Belgian Sheepdog should reflect the qualities of intelligence, courage, alertness, and devotion to master. To his inherent aptitude as a guardian of flocks should be added protectiveness of the person and property of his master. He should be watchful, attentive and always in motion when not under command. In his relationship with humans he should be observant and vigilant with strangers, but not apprehensive. He should not show fear or shyness. He should not show viciousness by unwarranted or unprovoked attack. With those he knows well, he is most affectionate and friendly, zealous of their attention, and very possessive. Viciousness is a disqualification.